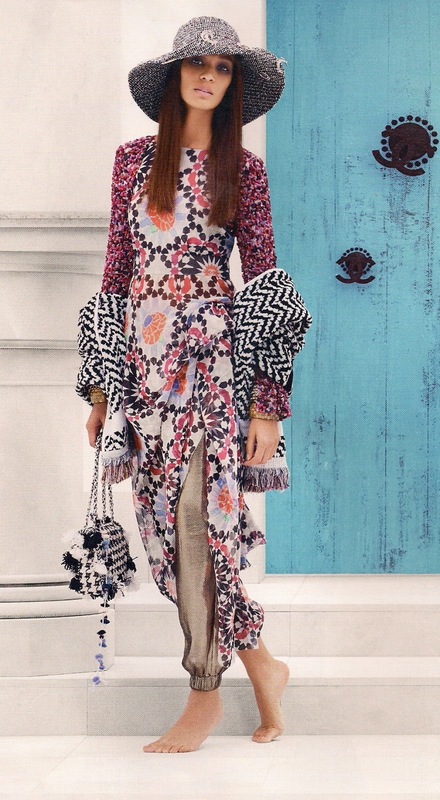 How I love this Chanel look for spring! All drapey, and gorgeous, and casual at the same time. Very dressed-up bohemian, and totally seventies. And those are some fancy pants, aren’t they? A bit too fancy for me. And maybe just a teensy bit too see-through? The Armani outfit below is better. Gosh, that looks comfortable and gorgeous. I love those flat shoes, and that tunic. But while those flowy, swirling pants are lovely, they’re not for me. And not just because they’re Armani (and thus way too pricey)… but because… well… I don’t do flow-y, or drapey, or swirling anything. I’m too much of a structured jacket and tailored pants kind of girl. At least I think I am. At least, I always have been. I love this Chanel look too. The layering is great. 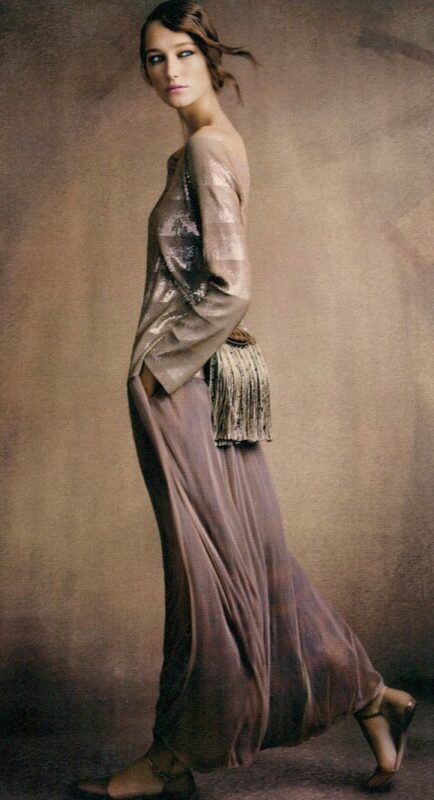 But I think I’d lose the hat and shawl and pair the pants with the Armani tunic and shoes above. Wouldn’t they make a wonderfully chic combo? Less flowy, still comfy? That’s if I had the budget for Chanel, and Armani. I saw those Chanel and Armani looks in Vogue a while ago, and ever since, I’ve been thinking of sweat pants as street-wear. Not necessarily fancy pants. But not the grey, stretchy sweat pants I’d wear to the gym, nor the ubiquitous black yoga pants, which everyone seems to wear everywhere. But a kind of in-between, sorta-dressy version. Not fancy, but still polished, and definitely comfy. Like these cream Vince “pin-tuck” joggers, below. Or these slim, black linen joggers, also from Vince, on the right. So I put “maybe look for joggers” on my spring shopping wish list. And when I was shopping for jeans at Aritzia last month, I saw that they had several styles of “dressy” sweat pants. I grabbed a few pairs on my way to the dressing room, imagining (assuming) that this was only the beginning of my search. “Right,” I laughed, “They’re size six.” She just grinned and, bowing to her greater knowledge of their products, I retreated to the dressing room. Still chuckling … size six, not unless I was having a flashback would I even think about a size six … I pulled them on. All the way on. They fit me. Perfectly. Ha. Well. I guess that shopping, like life, can still surprise me. These are my new “Harvey pants“, below. They are joggers on the bottom but trousers on the top, with two slash pockets and pin-tucks at the waist. Oh dear, that young model looks…sad, doesn’t she? And in dire need of some fresh air and sunshine, poor thing. 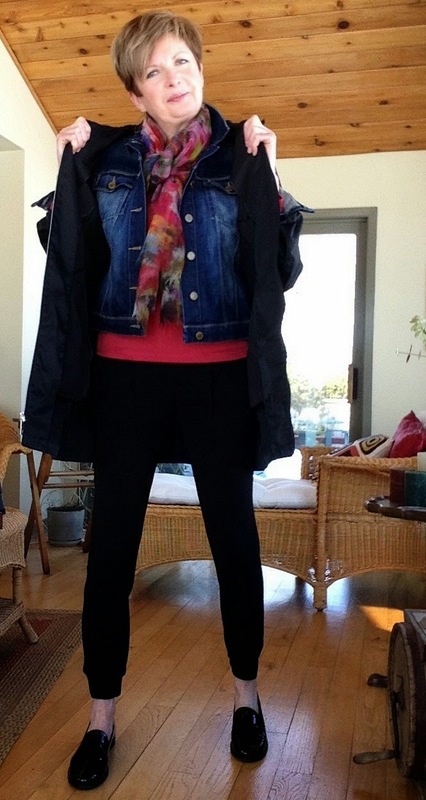 And if size six fits me… well, do sizes go into negative numbers do you think? 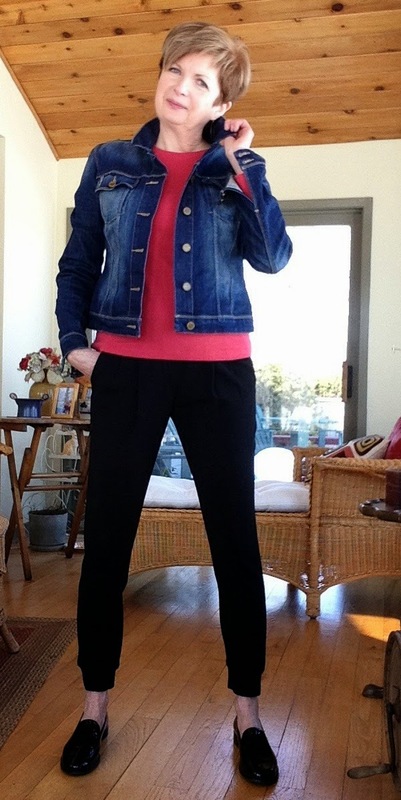 This is me in my new joggers, a white long-sleeved tee, my Paige jean jacket, and my Stuart Weiztman loafers. And a Burberry scarf that I love. The pants are slim through the hips and leg which I like. And the flat pleats in front totally disguise my middle age middle. “Oh, my gosh,” I said to Ruth, “Where did it go?? I seriously LOVE these pants!” Even if they are a bit shorter than I would like, they look good with my loafers, or with flat sandals. And with my red Gap tee shirt. So my new “Harvey” pants will be great for spring. But it’s a Canadian spring, remember. I will need to layer my Michael Kors raincoat over my jean jacket. And add a light scarf as well. And I’m not too sure about baring my ankles for a while yet, either. I’ve pretty much finished my spring shopping now. But no fancy pants were purchased. And nothing flowy, or drapey, or swirling. Because I’m not really a flowy kind of girl…. am I? I mean I could, maybe, try something flowy. I wouldn’t want to think I’m in a fashion rut. Maybe a top to go with my definitely NOT flowy joggers? Maybe a blouse that’s not totally drapey and flowy, but with slightly softer lines? Hmmm. Something to think about, eh? And on that very Canadian note (eh?) …. this is a shot of the river in front of our house this morning. 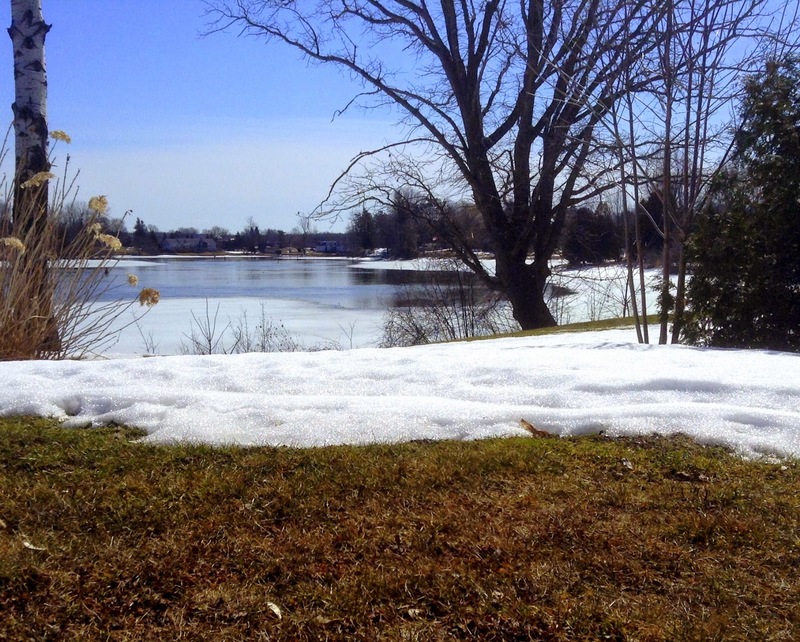 I see open water, and melting snow, and patches of bare grass. Spring has sprung. Hubby and I have donned our boots and are off for our walk. Hopefully the trail won’t be too muddy. But who cares, really. It’s sunny and 14 degrees….. and that’s above zero! How about you? Are you a fancy pants kind of person… or not? And has spring sprung where you live? I'm with you …about waiting to jump on trend bandwagons…if at all. Our walk was lovely, thanks. Good thing we went yesterday….we had several inches of snow last night! Drat! Hope the weather in Yorkshire is better. Hi there, your new joggers look great, I especially like the more tailored top. However, one question – do they eventually bag at the knee? Nonetheless, well done for navigating the trend and finding something that suits you! It sounds also like Aritzia has good customer service on the floor – I must take a closer look. Happy Easter! Thanks Patricia. I haven't worn the pants for a long time yet, but they shouldn't bag since they're not stretchy. They're made from a crepe-y fabric. Aritzia in Rideau Centre (if you're here in Ottawa) has a better selection than Bayshore. The store looks at first glance like a strictly teeny-bopper place…. so I'm glad I persisted.. with help from Ruth. You look fabulous in those pants! They look like they were made for you. Enjoy your lovely spring day! Thanks Sue. I love the pants although I am under NO illusion about that size six! Good thing we walked yesterday…we had snow last night. Spring unsprung, so to speak. You look great in these. I really like this trend. I bought one pair of taupe, silk joggers and now you have me wanting a black pair. I think they are fun and look great. Enjoyed the post. Thanks Pam. If I'm taking a chance on a new style, I always go with black…risky style+safe colour= greater comfort level for me. I have a pair almost exactly like yours, from Whistles. I think the slightly shorter length works well on you, and looks a little more current than a longer pair would. It is great with the loafers you are wearing. Have you ever worn them with heels? Hey…Wendy commented above that she has a pair from Whistles too. I haven't worn them with heels yet. I don't do heels that much any more. I should try them and see if I like the look. Thanks for stopping by. Those pants look very dressy considering they are sweatpants…six 6 too! 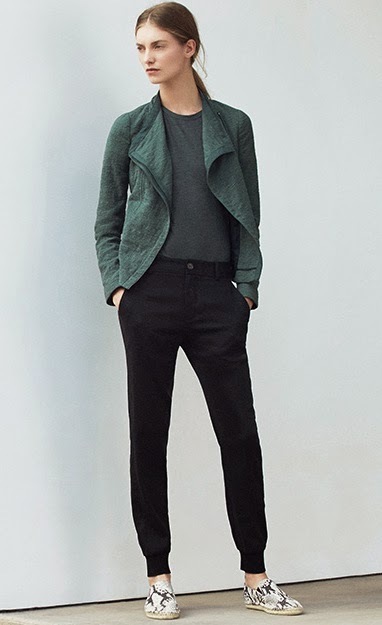 I might just have to go to Aritzia myself….they have lovely clothes. Weeelll…I'm not getting too caught up in the size six….it's just a number, isn't it? Hopefully I be saying the same thing if it was a size 16. Happy Easter to you too. Yes, these are fabulous – you could wear them every day! Thanks for sharing with Visible Monday, xo. Thanks, Patti. I probably will wear them ever day when we're in France. And thanks for hosting Visible Monday! 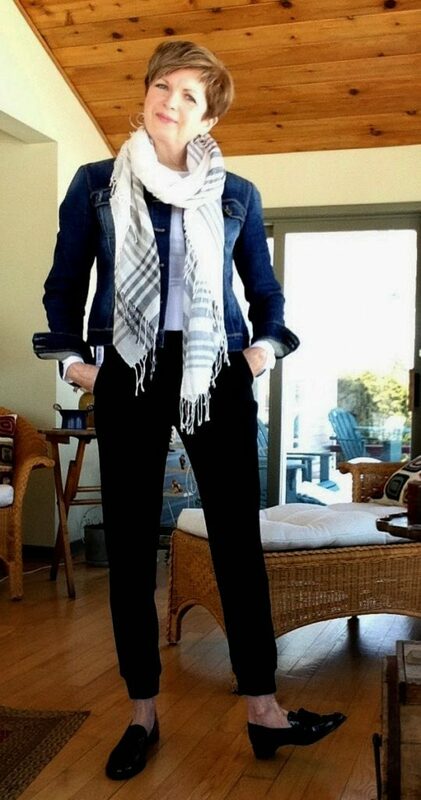 Great pants, so usual dressed up or down and just perfect with the loafers. Thanks Jill. And thanks for stopping by. I've been searching high and low for a pair of joggers that I like. Thanks for sharing these – I love the trouser at top, joggers at the bottom idea. You look absolutely fantastic in this outfit! Thanks, Lana. 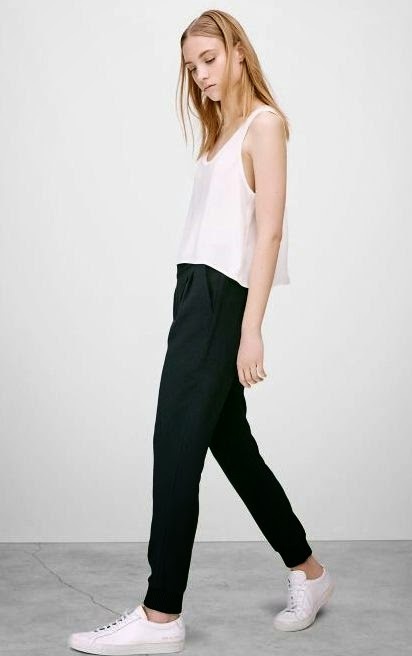 Aritzia clothing can be purchased on-line, you know. I included the link in the post. Hope you find your perfect pair. I'm a bit more of a casual pants type! Though I sure do love a good flare! Thanks for sharing with Fun Fashion Friday and have a great weekend! What a great look for you! Love it!